A while ago, I wrote a whole post here about the difference between time in the summer and the rest of the year. The Internet ate that post (with a little help from me), but I keep having reminders of this feeling: that time moves differently during the summer. Sometimes slower, sometimes faster, but really not the same as in the other seasons. June was two weeks straight of camp, then a busy 4th of July week with people coming and going, including me, and son practicing for his first band gig that Saturday. Where are we now? Camp is over, summer homework is starting to rear its semi-ugly head, and I’m just letting myself transition gently into yet another pace of living. Which, this week, means walks. I’ve got three Walks With Friends on the calendar, and I’m hoping all of them come off. It’s a good indication to me that I’ve been just a little too introverted, maybe even just a little too focused on head-calming-yoga, when all of a sudden I both want to get out and stretch my legs and reconnect with…oh, everybody. Today, I got up just a little early and met with Terri Thayer, one of my critique partners, to get in a creek-trail walk before our meeting. We walked a creek trail that we’ve often walked before, and we talked and talked. This is why Walks With Friends work so well for me–I don’t even notice the exercise. Sometimes, I don’t even notice the scenery, especially when it’s a familiar path and I can trust my co-walker to navigate. (I can get lost anywhere/anywhen if I leave the directional decisions to myself.) Today, though, I did notice. And I saw this. 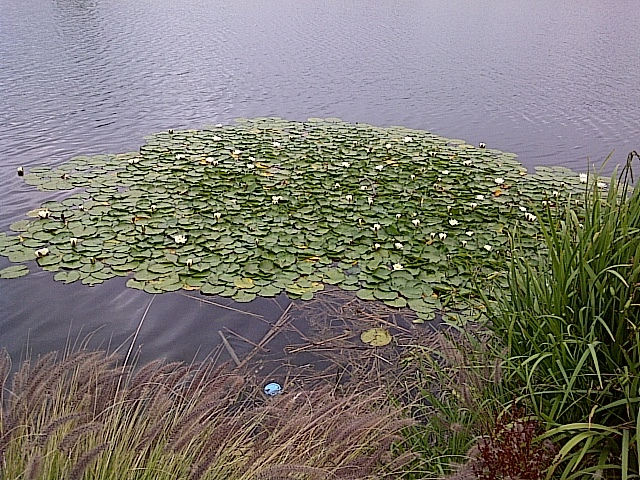 A huge mass of lilypads. Now I must have seen lilypads before. In fact, someone in my family is going to say, “DAD has lilypads in his pond.” But I have never come across yards and yards of them, with those huge, amazing flowers (which you can barely see) all over them. It was one of those surprise moments, one that pulls you out of the talking place, out of the hand-waving, laughing, story-telling, ignoring-all-nature place and says, “LOOK!” And, for all I know about lilypad blossoms, one of those moments that could only happen in the summertime? What’s different about the pacing, the moments, in your summer. And what do you do to make sure you enjoy whatever it is? Sounds like the right person for your walks! Walks with friends sounds so nice! Summer feels extremely frenetic to me. I love not having to wear fifty billion layers of clothes, but my kids are always running outside and I have to chase them (so the 3YO doesn’t bike to the park a mile away–on his own), the kids and the neighbor kids are flowing from house to house, it’s light all the time and everyone is therefore always away (ie not as much writing time), and…yeah. But it’s fun, too–the camps and swimming lessons and reunions–I have to look at them as filling the well time, as living time. Time in summer IS strange–sometime fast and sometimes slow, but highly punctuated with spontaneity. As to lily ponds–so pretty! We happened on one last week while driving a very, VERY backwoodsy road to Yellowstone, and wow, they are amazing! Exactly what you said–sometimes fast and sometimes slow. And I like the spontaneity!